Looking for the January NewFO Linky Party and Giveaway? Before I start, I want to remind you that today is the last day to link up to the January NewFO party and giveaway. Click on that link above to find it. The butterfly isn't actually fused down yet, but I put it there so that you could see it. It is three dimensional, and so there is fabric on both sides of the wings. The only part that will actually be fused to the background is the butterfly's body. The upper wings to the left of the body are fused along with the butterfly body, while the wings to the right will be stitched down when I'm ready to do the topstitching/quilting. The pattern told me to fuse the body and the wings on the left, but that seemed a recipe for losing it to me, and so I have it tucked into an envelope. I'll deal with the whole thing when I'm ready. I'll save that for another day, however. It's hard to say if it's the applique or the stress of the past couple of days, but I've developed a muscle spasm right between my shoulder blades. It is my personal "tell" when something is bothering me. Nevertheless, I think hunching over my workspace tracing and cutting out these pieces has to shoulder its share of the blame too. (Ha! Did you see what I did there? I'm so punny.) It's no laughing matter, however, because it is very painful. I was taking lightweight analgesics to try to keep it under control, but I've moved on to the harder stuff. That means that all I want to do is sleep them off. It started a couple of days ago, and by yesterday afternoon, it was excruciating. I've kept a heating pad on it for the past 12 hours or so, and that is helping. Hopefully, I'm going to feel good enough to start sewing the Intel Underneath quilt together today. 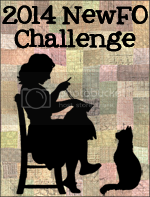 This quilt represents both of my goals for the Something Old, Something New challenge this month. The quilt is my "old" because I've been working on it since January of last year. As I mentioned in my goal-setting post earlier this month, I want to take the long-arm class at a local quilt shop and then rent some time on their machines. I want to have this as my first "solo" project after I learn to use their machines, and so that would constitute my "new". The person who teaches the classes comes down from Washington state, and when I spoke with her she was unsure whether she would be teaching a class in February. If she does, it will be at the end of the month. If not, it will be in March. The sooner the better for me because this quilt is for Matthew's graduation from engineering school, and that will happen in June. Oh yes, I almost forgot. I did one other thing yesterday. 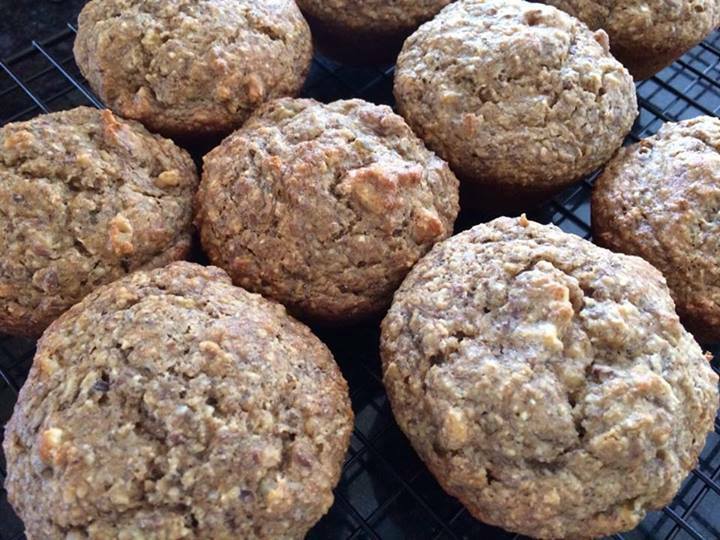 I baked these Healthy Breakfast Muffins from the Pioneer Woman. It's hard to put "healthy" and "muffins" together in the same sentence, but I think these actually are pretty healthy. They have just 1/3 cup of brown sugar and the fat of one egg yolk and some lowfat buttermilk. Otherwise, they are chock full of healthy stuff including five different flours and meals, bananas, applesauce (I used store-bought), walnuts, and raisins. I used golden raisins, but any kind of dried fruit would work in these. I've linked to the recipe above so you can give them a try if you'd like. I found all those different flours and meals in the health food section of my grocery store. The flaxseed meal was in the refrigerated section. You might also check your bulk foods aisle. I was able to purchase just what I needed there and avoided having a bunch of stuff around that would only rarely be used. Even if you have to buy the whole bag, it will keep for a long time in your freezer. It's a very cold day here in the Pacific Northwest. We probably sound like a pack of pantywaists to you folks in the truly cold states when we start whining about our temperatures. Today it is sunny and chilly with a temperature of 19°F. and a windchill of 11°F. I read a prediction on Facebook that we were supposed to get six inches of snow down to the valley floor on Saturday, but I have not seen that from a reliable source. We'll see. Snow is predicted, but I'm not sure yet how much. So onward. I have some housework to catch up on since I've done nothing else but work on Wind in the Whiskers for the past five days or so. My shoulder is calling the shots, however, and so I might spend the day lying on my heating pad. Yes, your body is speaking to you - take it easy today. I love the glads in this block - reminds me of my blooms to come. Definitely sounds like a day on the sofa to me! All that work on WITW calls for some relaxation time :) Love seeing your progress on that. I haven't started mine yet - may never get to it, but I'm collecting the patterns. That does look like a lot of cutting and applique, but it will all be worth it. I get stiff neck and shoulders too, stress and hunching being the worst culprits, lol. I use a microwave shoulder pad that releases moist heat, so much better than the heating pad. The quilt looks like a tough one, but you're doing a beautiful job. Hope you feel better soon. Wind in the Whiskers does look challenging but you seem to be going along all right. Love Intel Underneath, it glows with all those black lines. Good luck with the long arm class. Healthy Muffins sounds like a real oxymoron but delightful too! Your panel is absolutely gorgeous. Wind in the Whiskers is looking great! Hope your shoulder starts to feel better soon. Have a healthy muffin and take a break from your Wind in the Whiskers. You deserve it! The muffins do appear healthy! Were they as tasty as they look? The I Spy block is splendid! Sorry it took part in the pain in your shoulder. I hate that. Can you use Salon Pas patches? They work sooo well for me when I get a knot under by shoulder blade - like magic. I do hope it's feeling better asap. The quilt is coming along very nicely and it's going to be gorgeous when you finish it. I, too, had a severe spasm between my shoulder blades after a marathon quilting session. 30 minutes with a masseuse did the trick. Hope you feel better soon. It is amazing. I am so sorry that your shoulders are paining you! 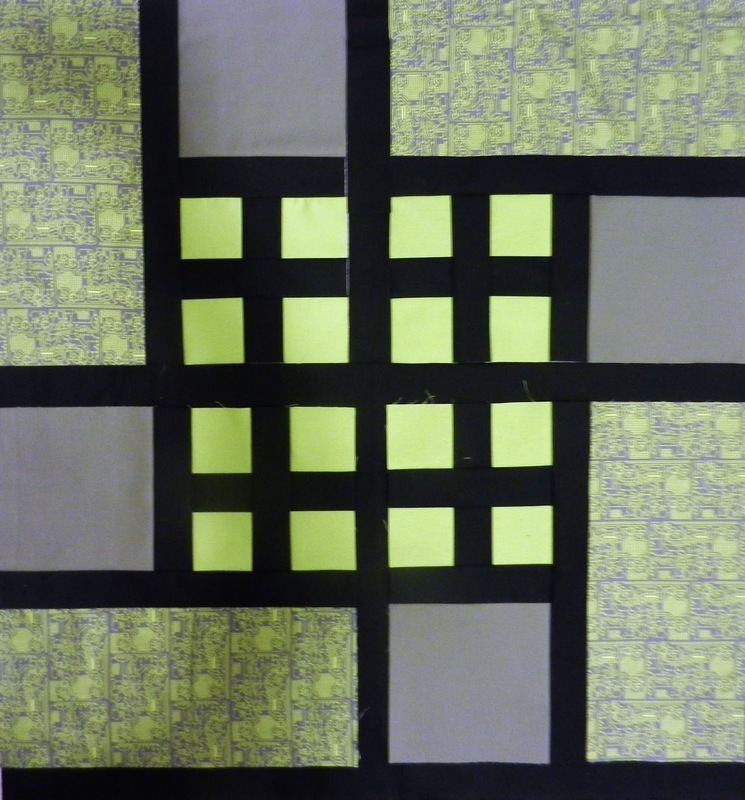 I am headed off to a free motion quilting class/retreat in the morning. There are 4 of going which makes up half the class. Our only concern is the icy roads between here and the retreat! I love that block it is so pretty. I never thought of taking a class in long arm quilting. I was thinking of taking a class in something but I'm not sure what I want to do.